Welcome back to another season of Fantasy baseball. Each week, we’ll offer you waiver wire recommendations of players that are most likely available in your leagues (maximum 50 per cent ownership in both ESPN and CBS formats). Sometimes they will be merely short-term adds, sometimes they will be keeper or dynasty options that you should consider, but mostly they will be targeted for helping your 2019 championship goals. This week, Gleyber Torres became the youngest Yankee with a four-hit, three extra-base hit-day since Joe DiMaggio; Clayton Kershaw (shoulder) was meh in his first rehab start; and Noah Syndergaard had yet another rant over the schedule. 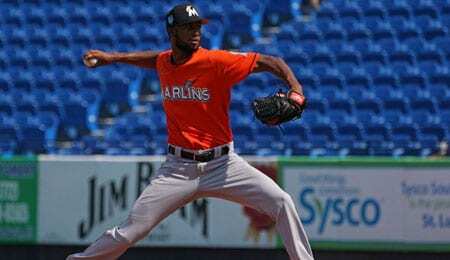 Sandy Alcantara, SP, Miami Marlins (ESPN: 19.6 per cent; CBS: 47 per cent): After his dominant season debut (a career-high eight shutout innings of four-hit ball with six Ks and no walks), Alcantara is clearly well worth rostering. On Saturday, he’ll start against the Braves, and this should be a good test for him as Atlanta has hit well to begin the season. Alcantara showed nice promise with the Fish last year, putting up some solid hit rates in a half dozen starts down the stretch. Many think the young flamethrower will ultimately be bullpen-bound, but if he can continue to control his stuff (see video below), he has a chance to stick in the rotation long-term, and could emerge as a very special talent. Max Fried, SP/RP, Atlanta Braves (ESPN: 4.9 per cent; CBS: 26 per cent): Continuing our theme of young hurlers that really impressed in their first starts of the season, how about Fried? All he did was limit the Cubs to one measly hit over six innings while fanning five without a walk on Thursday. That outing earned Fried a repeat engagement in the Braves’ rotation, although given that it’ll be in Colorado, you may not want him active. He made a few starts for Atlanta last year, but mostly pitched out of the bullpen, and after a couple of relief outings to begin this season, he sure looked like he wanted to stick as a starter. If Fried can be anywhere near as phenomenal going forward, he could wind up being a real steal. Spencer Turnbull, SP, Detroit Tigers (ESPN: 2 per cent; CBS: 8 per cent): Rounding out of trio of young pitchers that have wowed us early is Turnbull, who whiffed a career-high 10 batters in a no-decision in Detroit’s home opener on Thursday. Although he lost his debut last week, he wasn’t bad at all and, early on, his hit rates have improved over his limited action last year. The fact Turnbull induced 15 swinging strikes on Thursday suggests he was showing some very good stuff. Give him a look. Alex Gordon, OF, Kansas City Royals (ESPN: 5.4 per cent; CBS: 13 per cent): The Royals are struggling early on, but don’t blame Gordon, who is off to a surprisingly good start, reminding us that he was once a Fantasy asset. Could he have another Fantasy worthy season in him? Batting third in the lineup, Gordon has had back-to-back multi-hit games, homering in each, while scoring three times and driving in four. He bounced back somewhat last year; maybe he’s got a bit more recovery left in the tank at age 35. JB Shuck, OF, Pittsburgh Pirates (ESPN: unowned; CBS: unowned): Shuck is seeing regular action with Corey Dickerson out, mostly batting seventh. Shuck has delivered hits in back-to-back games, driving in one and scoring one with a pair of walks on Wednesday. He returned to the majors last year as a fifth outfielder type, but perhaps he’ll offer some short-term value in very deep NL-only leagues for the time being. In his season debut last year, Shuck went 4-for-4 against the Pirates, so they must have liked what they saw, inking him to a minor league deal in late-January. Dansby Swanson, SS, Atlanta Braves (ESPN: 15 per cent; CBS: 35 per cent): After struggling in 2017 and making only modest progress last year, Swanson finally looks like he’s coming into his own this season as he piles up the counting cats early. What we’re especially impressed with is the growth in his walk rate so far. Swanson is finally a viable Fantasy option with the chance to live up to the hype from 2016. Shortstop C.J. Chatham, Boston’s 2016 second rounder, looks like he’s making a seamless transition to Double-A so far, delivering four hits (including two double) in his first two games. Carlos Santana is off to a blazing start in his return to Cleveland. On Friday, he hit his first homer — a walk-off blast to beat the Jays — and it looks, at least early on, as if he’ll enjoy solid counting cats despite a fairly weak Indian lineup. The O’s have made an effort to upgrade their rotation by signing Dan Straily, who was surprisingly released by the Fish in late-March. He slightly improved his homer rate last year, but moving from 2018’s most homer-restrictive park to one of the most homer-happy stadiums is a recipe for disaster. American funksters Kool and the Gang got its start way back in 1964, and is still at it today. The band was featured on a 1993 collection called Funky Stuff: The Best of Funk Essentials, with a pair of tracks, including the oft-sampled “Jungle Jazz,” originally released in 1975.